Innes, Robin J. 2010. Linanthus pungens. In: Fire Effects Information System, [Online]. U.S. Department of Agriculture, Forest Service, Rocky Mountain Research Station, Fire Sciences Laboratory (Producer). Available: https://www.fs.fed.us/database/feis/plants/shrub/linpun/all.html . The scientific name of granite prickly phlox is Linanthus pungens (Torr.) J.M. Porter and L.A. Johnson (Polemoniaceae) . Granite prickly phlox is native to western North America. It occurs from east of the Cascade Range in southern British Columbia, Washington, and Oregon east to Montana and south to New Mexico and northern Baja California . Plants Database provides a distributional map of granite prickly phlox. Granite prickly phlox occurs in dry, open forest, woodland, shrubland, and grassland habitats and their intergradations. At low elevations, granite prickly phlox occurs in and on the edge of sagebrush (Artemisia spp.) and salt-desert shrublands. It occurs in pinyon-juniper (Pinus-Juniperus spp.) woodlands at midelevations, bristlecone pine (P. longaeva) and whitebark pine (P. albicaulis) communities in subalpine areas, and in alpine "fell-fields" on the high peaks of the Sierra Nevada and the Cascade Range [9,49,64,97,120,127]. Throughout its range, granite prickly phlox occurs in forests and woodlands dominated primarily by pine (e.g., ponderosa pine (P. ponderosa), Jeffrey pine (P. jeffreyi) [32,49,64,97,112,119,138], whitebark pine [61,77,123], Sierra lodgepole pine (P. contorta var. murrayana) [61,64,123,125], limber pine (P. flexilis) ([1,6,64,76], Mooney 1973 cited in ), bristlecone pine ([77,144], Mooney 1973 cited in ), western white pine (P. monticola) , singleleaf pinyon (P. monophylla) [15,61,99,126,132], and Colorado pinyon (P. edulis) [7,53,86,115]) and juniper (e.g., Utah juniper (J. osteosperma) [7,14,15,53,86,115], Rocky Mountain juniper (J. scopulorum) [59,113,124], and western juniper (J. occidentalis) [21,36,46]). Granite prickly phlox also occurs commonly with white fir (Abies concolor) [61,126,132], mountain hemlock (Tsuga mertensiana) [27,77], and Douglas-fir (Pseudotsuga menziesii) . Woodlands and forests with granite prickly phlox include limber pine forest on the Medicine Bow National Forest in southeastern Wyoming ; limber pine-Great Basin bristlecone pine woodland in the White Mountains of east-central California (, Mooney 1973 cited in ); Jeffrey pine forest on the east slope of the central and southern Sierra Nevada ; ponderosa pine-Jeffrey pine forest on the Lassen National Forest in northeastern California ; western juniper/big sagebrush/Idaho fescue-bluebunch wheatgrass (Artemisia tridentata/Festuca idahoensis-Pseudoroegneria spicata) woodland in central Oregon ; and Rocky Mountain juniper/antelope bitterbrush (Purshia tridentata) woodland habitat types on the Roosevelt National Forest, Colorado . Granite prickly phlox occurs commonly in sagebrush (Artemisia spp.) steppe, ecotones where sagebrush intergrades with pinyon-juniper woodlands, and desert shrublands (e.g., [7,21,53,64,83,126]). It occurs commonly in big sagebrush [13,14,27,99,124,126,128,129,134,146], low sagebrush (A. arbuscula) [26,81,82,83,94,146,148], black sagebrush (A. nova) [15,99,126,148], and threetip sagebrush (A. tripartita) [18,54,79] communities. For example, it occurred in big sagebrush/western needlegrass (Achnatherum occidentale) shrubland in central Oregon , and it was common in big sagebrush/needle-and-thread grass (Hesperostipa comata) shrubland in Nevada  and northeastern California . In southeastern Idaho, granite prickly phlox occurred in big sagebrush-winterfat/thickspike	wheatgrass (Krascheninnikovia lanata/Elymus lanceolatus) shrubland . Granite prickly phlox grows in low sagebrush/bluebunch wheatgrass, low sagebrush/Thurber fescue (F. thurberi), and low sagebrush/Idaho fescue communities in northern Nevada , and in central Nevada it occurred in big sagebrush/Sandberg bluegrass (Poa secunda) communities . Granite prickly phlox also occurs in sagebrush/annual grass communities. Cheatgrass (Bromus tectorum) is a common dominant, nonnative annual grass in communities with granite prickly phlox (e.g., [6,11,55,128,146,147]). Rabbitbrush (Chrysothamnus spp.) [13,15,27,44,83,99,134,147]), goldenbush (Ericameria spp.) [27,105,113], and saltbush (Atriplex spp.) [9,44,131,138] are common dominant plants in desert shrub communities with granite prickly phlox. Granite prickly phlox is an associated species in antelope bitterbrush/Idaho fescue steppe of north-central Washington . Granite prickly phlox occurs in dry, perennial grasslands, such as bluebunch wheatgrass/Sandberg bluegrass grasslands at Craters of the Moon National Monument in southern Idaho  and bluebunch wheatgrass/blue grama (Bouteloua gracilis) grasslands in western Montana . In the Cheyenne River Basin in eastern Wyoming, granite prickly phlox occurred in blue grama/threadleaf sedge (Carex filifolia) sodgrass steppe and needle-and-thread grass/blue grama sodgrass steppe . It also occurred in needle-and-thread grass/mountain muhly (Muhlenbergia montana) on the Roosevelt National Forest in central Colorado . Granite prickly phlox frequently occurred in alpine grasslands in Oregon, California, and Nevada [63,105,120]. Alpine grasslands occupied by granite prickly phlox are dominated by perennial grasses (e.g., bluegrass (Poa spp. ), mat muhly (M. richardsonis), prairie Junegrass (Koeleria macrantha), bottlebrush squirreltail (Elymus elymoides), and pine needlegrass (Achnatherum pinetorum)), sedges (Carex spp. ), and a variety of forbs such as phlox (Phlox spp. ), draba (Draba spp. ), and rockcress (Arabis spp.) [82,104,120,125]. Botanical description: This description covers characteristics that may be relevant to fire ecology and is not meant for identification. Keys for identification are available (e.g., [48,49,58,60,67,93,96,97,127,137]). Form and architecture: Granite prickly phlox is a perennial , semievergreen , low-branching shrub or subshrub [50,138] that may be mat-forming [50,58,93]. It has several to many stems [17,67,97,137]. Stems are suffrutescent [48,49,57,85,93]. Although stems are woody at the base, granite prickly phlox is often called a forb (e.g., [44,53,91,115,120,123]). Stems are densely leafy [57,73]. Granite prickly phlox ranges from 4 to 32 inches (10-80 cm) tall [17,48,60,67,93,97], but tends to be <16 inches (40 cm) tall [6,38,48,60,93,96,97,148]. It grows taller at low elevations and becomes more mat-like at high elevations  (see Elevation). Leaves: Granite prickly phlox leaves are rigid and sharp-pointed . The leaves usually persist for 1 to several years . Both the leaves and flowers are aromatic [28,58,67,97,138]. Reproductive structures: Flowers are sessile or nearly so, tending to open in the evening [28,48,49,60,96,97]. The flowers are solitary or occur in compact, terminal clusters [17,48,50,73]. The corolla is funnel-shaped and ranges from 0.4 to 0.9 inch (1.0-2.5 cm) long [28,48,49,50,57,138,142]. Generally, the flowers are white or cream colored, although pinkish or yellowish flowers are sometimes found [28,48,50,57,60,67,73,93,138,142]. Granite prickly phlox fruit is a 3-valved capsule that splits open at maturity to release small seeds [93,97,142]. Capsules are cylindrical  and 3.5 to 5.5 mm long [28,138]. Seeds are brown, oblong, and about 1.2 mm long . Each valve of the seed capsule contains about 5 to 10 seeds . Roots: Granite prickly phlox is tap-rooted . Rooting depths are generally <2.5 feet (0.8 m) . Smith  characterized granite prickly phlox as "deep-rooted" and stated that "most" roots occur in the upper 1.5 to 3 feet (0.5-0.9 m) of the soil and "many" roots extend >3 feet . On sites in the Fremont National Forest, Oregon, where total soil depth was 16 to 36 inches (41-91 cm), rooting depth of granite prickly phlox was typically 9 to 20 inches (23-51 cm). Some roots reached depths of 36 inches . In western juniper woodland in Oregon and Washington, granite prickly phlox roots averaged 30 inches (76 cm) deep where soils averaged 30 inches deep; some roots penetrated underlying cracked bedrock . For more information about soils and rooting depth, see Soils. Stand and age class structure: Communities with granite prickly phlox are usually open, with scattered shrubs and herbs and extensive bare interspaces (e.g., [1,22,70,113,115,124,126]). Granite prickly phlox does not usually contribute substantial cover to plant communities and occurs in low abundance, although it is often common [13,15,59,124,148] and may occur in dense clumps . On the Roosevelt National Forest, granite prickly phlox occurred with 100% constancy in 4 stands of Rocky Mountain juniper/antelope bitterbrush and 4 stands of Rocky Mountain juniper/big sagebrush, but its cover was ≤1% in both communities . In this review, constancy is defined as the percent of stands of a plant community with granite prickly phlox. See Fuels for more information on granite prickly phlox cover. Limited information was available on granite prickly phlox's age class structure as of this writing (2010). West and others  reported that granite prickly phlox lived much longer on unbrowsed than browsed plots at the US Sheep Experiment Station in Idaho. Mean life span of granite prickly phlox was 2.0 years on browsed and 2.9 years on unbrowsed plots when all age classes were combined. Mortality was >70% in the first year of life but decreased with age. Mean life spans increased to 4.2 years for browsed and 8.5 years for unbrowsed sites when the seedling stage was ignored. Granite prickly phlox's maximum life span was substantially higher on unbrowsed (41 years) than browsed (9 years) plots, possibly because moisture and nutrients were reduced on browsed plots, but the difference was not significant due to high variability among individuals. When data from browsed and unbrowsed plots were combined, results indicated that survival was high once granite prickly phlox reached 3 years old . Physiology: Granite prickly phlox's presence in arid and semiarid environments suggests that it is highly drought tolerant [1,59,105,136,147]. It is flood intolerant . Its presence in black greasewood-fourwing saltbrush (Sarcobatus vermiculatus-Atriplex canescens)-green rabbitbrush shrubland on Stansbury Island in the Great Salt Lake of Utah  suggests that it is salt tolerant. Granite prickly phlox flowers. Photo courtesy of Larry Blakely, CalPhotos. Regeneration processes of granite prickly phlox were poorly understood as of this writing (2010). Granite prickly phlox appears to reproduce primarily via seed. Pollination and breeding system: The narrow calyx favors an insect pollinator with a long proboscis. Butterflies may be the most frequent pollinators of phlox . Meinke  stated that butterflies in the Pieridae and Lycaenidae families and some moths in the Sphingidae family were the primary pollinators of granite prickly phlox in the Snake River Canyon, Idaho. Seed production and dispersal: No information is available on this topic. Seed banking: Only one study gives information on seed banking by granite prickly phlox. In the Okanangan Valley of southern British Columbia, granite prickly phlox ranked 21 out of 39 species in aboveground density (41 plants/m²) and contributed only a small portion of seeds to the seed bank, 0.1 seed/m² on average . Germination: No information is available on this topic. Seedling establishment and plant growth: Granite prickly phlox apparently requires full sun for establishment and growth . In big sagebrush communities of western Nevada, granite prickly phlox seedlings established only in areas where the shrub canopy was eliminated either by fire and subsequent domestic livestock browsing or by herbicides . In Zion National Park, Utah, granite prickly phlox occurred only at sites with high solar irradiation . Age at first reproduction was unknown as of this writing (2010). Smith  characterized granite prickly phlox as "late-maturing". Vegetative regeneration: No information is available on this topic. Granite prickly phlox occurs on dry, open, often sandy or rocky places from deserts and plains to alpine sites. Apparently granite prickly phlox prefers full sun, medium to coarse soil textures, soil pH from moderately acid to moderately alkaline, and shallow to moderate soil depths . Soils: Granite prickly phlox occurs typically on coarse, shallow, skeletal, well-drained, nutrient-poor soils (e.g., [50,57,58,61,64,67,72,85,93,105]). 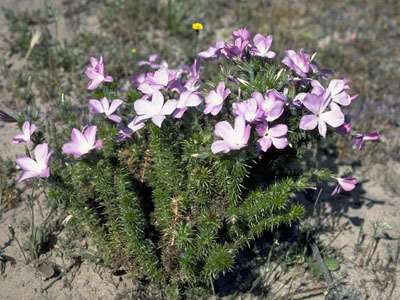 Order: Granite prickly phlox grows on mollisols [13,148], aridisols [13,148], and entisols . Texture: Most soils supporting granite prickly phlox are coarse [1,15,45,46,59,63,124,134,136,139] and commonly rocky, gravelly, or cobbly (e.g., [1,4,77,82,105,119,120,126,142,148]). However, granite prickly phlox also grows in very fine  and fine [15,44,45,86] soil textures. Granite prickly phlox occurs in sand [15,134], loamy sand [40,40,45,59,63,99,134], loam [13,15,45,99,139], and sandy loam [46,59,86,99]. In old-growth western juniper woodlands of central Oregon, granite prickly phlox increased with increased sand content at 7 sites . Granite prickly phlox occurred in Rocky Mountain juniper/antelope bitterbrush woodlands where coarse fragments constituted 33% to 45% of the soil profile and in Rocky Mountain juniper/big sagebrush woodlands where coarse fragments constituted 45% to 55% of the soil profile . In the Cheyenne River Basin, it occurred in skunkbush sumac (Rhus trilobata)/bluebunch wheatgrass shrublands where coarse fragments of all sizes covered the ground surface and were abundant throughout the soil profile . Less commonly, granite prickly phlox is found in clay soils [13,45,63], although clay soils supporting granite prickly phlox often have coarse fragments . Depth: Soils supporting granite prickly phlox are shallow [1,59,81,115,126,136,148] to moderately deep [124,126,136,146]. On No Man's Land Mesa in Utah, granite prickly phlox occurred on upland sites in Colorado pinyon-Utah juniper woodlands but did not occur in Colorado pinyon-Utah juniper woodlands on upland shallow breaks, a result attributed to the "distinctly different" soils. The upland soils were deep (2-3 feet (0.6-0.9 m)), well-drained, loamy fine sands, whereas the shallow breaks soils were shallow, well-drained, very fine sandy loams . On the Fremont National Forest, granite prickly phlox occurred where total soil depth was 16 to 36 inches (41-91 cm); it was most common in soils <24 inches (61 cm) deep . In Rocky Mountain juniper/antelope bitterbrush woodlands, granite prickly phlox occurred in soils 2 to 9 inches (6-22 cm) deep. In Rocky Mountain juniper/big sagebrush woodlands, it occurred in soils 2 to 8 inches (4-20 cm) deep . Granite prickly phlox also occurred with trace cover in needle-and-thread grass/mountain muhly grasslands, where soils ranged from 17 to 26 inches (43-66 cm) deep . In the Upper Rio Puerco watershed, New Mexico, granite prickly phlox occurred in soils that were >60 inches (152 cm) deep with A horizons <10 inches (25 cm) deep . Soils supporting granite prickly phlox are often poorly developed, overlying bedrock [46,68] or claypan [40,148]. Near timberline in the central Sierra Nevada, granite prickly phlox occurred in soils that were described as a "thin veneer of weathered rock with only a modicum of soil development" . At the US Sheep Experiment Station, granite prickly phlox occurred in threetip sagebrush-bluebunch wheatgrass shrublands where soils were 20 to 39 inches (50-100 cm) deep and underlain by basaltic bedrock . Granite prickly phlox often occurs in areas of exposed rock such as on rocky outcrops, benches, and ledges [9,59,115,117]. In many communities in which granite prickly phlox occurs, such as black sagebrush communities, a dense claypan occurs close to the soil surface . Soil depth to hardpan was 24 inches (61 cm) in big sagebrush/Idaho fescue shrublands in eastern Oregon . pH and parent materials: Soils supporting granite prickly phlox may be moderately acid [46,59,126,136], neutral [46,118,124,124], or moderately alkaline [59,118,124,136]. In Rocky Mountain juniper/antelope bitterbrush communities, granite prickly phlox grew in soils with pH ranging from 6.6 to 6.8 . In Rocky Mountain juniper/big sagebrush woodland, it grew in soils with pH ranging from 7.0 to 7.6 [59,136]. Granite prickly phlox also occurred with trace cover in a needle-and-thread grass/mountain muhly grassland where soil pH ranged from 6.2 to 6.8 , and in a bristlecone pine woodland where soil pH ranged from 5.9 to 8.1 . Granite prickly phlox occurs in soils derived from many parent materials, including sandstone [77,91,126], granite [61,91,126], rhyolite , dolomite , limestone [9,61,126], gneiss [59,136], and schist [59,136]. It commonly occurs on substrates derived from volcanics [9,63,113,119], such as basalt at Craters of the Moon National Monument, Idaho [6,34], and andesite at Carson Pass, California . In Oregon, granite prickly phlox occurred in soils derived from pumice . In big sagebrush steppe of the Snake River Plains, granite prickly phlox density generally increased with lava flow age and crevice depth, with granite prickly phlox apparently preferring old, soil-covered lava flows to young lava flows . Granite prickly phlox occurs in calcareous soil [44,84,98,144], but growth appears greater in noncalcareous soil [47,84,144]. In the White Mountains, Marchand  found that the distribution of the silvery lupine-big sagebrush-granite prickly phlox association was negatively related to percent exchangeable potassium. In this study, granite prickly phlox occurred on calcium carbonate (limestone- and dolomite-derived) and noncarbonate (basalt-, sandstone-, and adamellite-derived) substrates but was most common on noncarbonate substrates. It may have had a strong affinity for noncarbonate substrates, because carbonate substrates had low percent exchangeable potassium, high pH, low soil temperature, and low available phosphorus and iron . In another study in the White Mountains, granite prickly phlox occurred on dolomite (1.9 plants/50 m, 0.3% cover), sandstone (4.2 plants/50 m, 0.7% cover), and granite (3.9 plants/50 m, 0.7% cover), appearing less well developed on dolomite than other substrates. Dolomitic substrates had more available moisture, higher pH, and lower amounts of available phosphorus compared with other substrates . 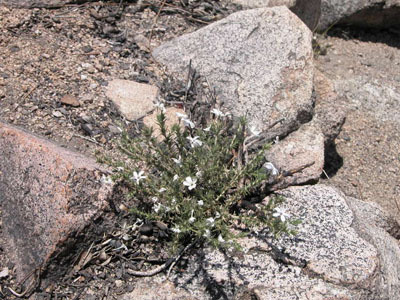 In the San Bernardino Mountains of southern California, granite prickly phlox occurred only on noncarbonate substrates . Moisture: Granite prickly phlox tolerates and is most common on xeric soils [1,59,105,123,136,147] but also grows on mesic soils . 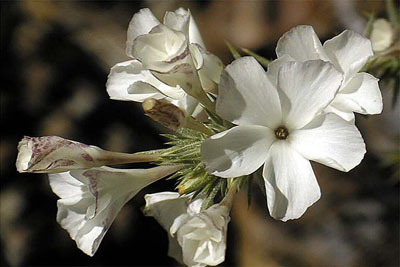 Smith  stated that granite prickly phlox in North Park, Colorado, occurred most commonly on sites with "good moisture relationships with respect to both summer and winter precipitation" but also occurred on drier sites where snow accumulated and stored moisture was "good". For more information, see Climate. Topography: Granite prickly phlox typically occurs in open, exposed places on flat to steep sites (range: 0-65°) [1,63,82,99,105,110,124,136] on all aspects [13,59,119,124,128,147]. It occurs on washes, bajadas, mesas, and buttes in the desert plains [17,48,67,99,142] and on dry eastern slopes and summits of the montane, subalpine, and alpine zones of the Sierra Nevada and the Cascade Range [41,42,60,63,67,72,77,120,126,137]. Granite prickly phlox habitat on San Bernardino National Forest, California. Photo courtesy of Thomas Stoughton, CalPhotos. Granite prickly phlox is common on exposed, windy ridges and summits that are often swept free of snow in winter [1,22,105,123,124,125]. In these areas, it often grows in microsites where snow may accumulate, such as between boulders, in rock crevices [9,105,118], and on leeward slopes . It also occurs in areas where soils are unstable, where wind and water cause soil erosion and deposition such as steep, unstable scree slopes , and where freeze-thaw cycles create frost scars and turf banks [90,123]. In Utah, it occurred on sand dunes and "dune-like" mounds [44,86], and in Nevada and New Mexico it occurred on alluvial fans [13,45,128] and canyon floodplains [13,128]. Granite prickly phlox often occurs on rough, broken topography such as the "breaks" of the Upper Rio Puerco watershed of New Mexico  and stream terrace benches in north-central Washington  and central Nevada . Although granite prickly phlox may occur on all aspects, it is most common on south-, east-, southeast-, and southwest-facing slopes [1,13,90,105,115,120,136], particularly at high elevations [76,90,105,120]. It occurred on rock piles and ledges on south- and east-facing slopes on the rims of sheer-walled cirques in the White Mountains . In Canyon de Chelly National Monument in Colorado, it occurred on south-facing slopes . Granite prickly phlox occurred on south-east facing slopes in Douglas-fir-limber pine forest in the Crested Butte area of Colorado . In Rocky Mountain juniper/antelope bitterbrush woodlands, it occurred on steep (50-75%), rocky, east-, south-, and west-facing slopes, and in Rocky Mountain juniper/big sagebrush woodlands it occurred on steep (45-75%), rocky, south-facing slopes . In Zion National Park, Utah, granite prickly phlox occurred only at sites with high solar irradiation  (see Seedling establishment and plant growth). However, granite prickly phlox occurred on steep, mesic, north-facing canyons in white fir-singleleaf pinyon woodland in the high desert ranges of the eastern Mojave Desert [61,126,132] and on north-, northwest-, and west-facing slopes in singleleaf pinyon/big sagebrush/Sandberg bluegrass woodlands in central Nevada . In the Cheyenne River Basin, granite prickly phlox occurred on north- and west-facing slopes in skunkbush sumac/bluebunch wheatgrass . Climate: Granite prickly phlox tolerates cold, harsh winters and dry, hot summers [43,46,111,146]. It occurs in alpine zones in the White Mountains, which are cold (mean annual temperature: 28 °F (-2 °C)), semiarid (mean annual precipitation: 15.5 inches (39.4 cm)) , and characterized by extremes of low temperature, wind, low atmospheric pressure, and high ultraviolet radiation . Precipitation falls mostly in winter as snow . Granite prickly phlox occurs in areas with high-magnitude diurnal and seasonal temperature fluctuations [2,123]. At the Navajo National Monument in northern Arizona, it occurred in Colorado pinyon-Utah juniper woodland where annual temperatures ranged from -9 to 100 °F (-23 to 38 °C), with a mean of 50 °F (10 °C) . In black sagebrush communities in northern Nevada, mean annual temperature was 48 °F (9 °C), with average winter (December-February) temperature of 36 °F (2 °C) and average summer (July-August) temperature of 69 °F (21 °C) . At the Idaho National Engineering Laboratory in southeastern Idaho, granite prickly phlox occurred in big sagebrush steppe where mean annual temperature was 42 °F (6 °C) . Granite prickly phlox occupies sites where precipitation is low and seasonally variable. On many sites where granite prickly phlox occurs, most precipitation falls in winter and spring, and soils are dry by the end of summer [2,2,46,86,90,105,115,123]. As a result, available moisture is out of phase with temperatures suitable for growth . Conversely, in Colorado pinyon-Utah juniper woodland in northeastern Arizona, the wet season occurs from late summer to fall , partially overlapping the granite prickly phlox growth period. Typically, pinyon-juniper woodlands in New Mexico and eastern Arizona receive more warm-season precipitation and have greater production potential for plants in general than pinyon-juniper woodlands in Nevada and northwestern Utah (Clary 1975 cited in ). As of this writing (2010), it was unclear how granite prickly phlox growth is affected by regional climate differences. Across granite prickly phlox's range, mean annual precipitation ranges from approximately 10 inches (250 mm)  to 50 inches (1,270 mm) . Throughout granite prickly phlox's range, growing seasons are short [61,77]. Granite prickly phlox was a common shrub in whitebark pine-mountain hemlock forest in subalpine regions of California, where the growing season ranges from 49 to 63 days . Frost can occur during half of the year or more . 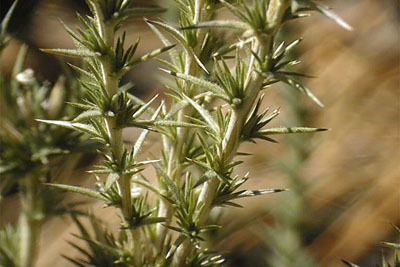 At the Idaho National Engineering Laboratory, granite prickly phlox occurred in big sagebrush steppe where the frost-free period is about 90 days , and it occurs where the number of frost-free days averages 155 days in Colorado pinyon-Utah juniper woodland at the Navajo National Monument . Granite prickly phlox often occurs on wind-swept sites where snow cover is limited (see Topography). In the Sierra Nevada, it occurred at sites that were wind-exposed and relatively snow free in winter—so little meltwater was received in spring—and at sites where snow cover was variable. However, all sites where granite prickly phlox occurred were well-drained, so even where meltwater was available in spring, soils were droughty by the end of summer [105,123]. Granite prickly phlox occurs in all stages of succession. Although present in "low seral"  and "low-mid seral" ) plant communities, it most often occurs in "high-seral" or "climax" types [1,43,45,63,104,123]. Granite prickly phlox is highly light tolerant [56,121,145] and presumably shade intolerant. It persists in open forests and woodlands (see Habitat Types and Plant Communities) and is presumably shaded out if canopies close. Since granite prickly phlox is usually killed by fire  and has no known adaptations to fire, it appears to regain cover slowly after fire or other disturbances that remove shrubs (see Other Management Considerations and Plant response to fire). Grazing has mixed effects on granite prickly phlox succession, depending on grazing pressure, season, and site. Granite prickly phlox occurs in many habitats where shrubs, including granite prickly phlox, typically increase with time since disturbance . For example, granite prickly phlox is common in sagebrush and pinyon-juniper woodland. In these communities many woody dominants are killed by fire and require long fire-free periods to establish and mature, so early-successional stages following fire are often dominated by herbaceous species (Billings 1994, Miller and Wigland 1994, cited in ). A study published in 1974  described a sequence of successional stages following fire in Utah juniper woodlands of west-central Utah, based upon examination of several burns of different ages (range: 3 to >100 years old) with an unknown history of grazing. After fire, an annual grass phase lasting 3 to 4 years was succeeded by a perennial grass-forb stage by postfire year 5 or 6 if native bunchgrasses were present prior to the fire. Shrubs, likely including granite prickly phlox, gradually established thereafter. A perennial grass-forb-shrub stage was followed by a perennial grass-forb-shrub-young Utah juniper stage, a shrub-Utah juniper stage, and ultimately, Utah juniper woodland. Sagebrush and other shrubs, likely including granite prickly phlox, generally became dominant after 35 years and Utah juniper after approximately 70 years, at which point other plant species were reduced sharply in density. Utah juniper woodlands were well developed 85 to 90 years after fire. The authors noted that the rate and trajectory of succession after fire varied due to factors such as seed availability and prefire vegetation composition. Because of widespread domestic livestock grazing and introduction and spread of nonnative invasive plants since European settlement, other successional sequences are also possible in sagebrush and pinyon-juniper woodland. The authors suggested that at locations where fire-tolerant perennial species such as bluebunch wheatgrass were abundant prior to fire, the annual stage may be shortened or bypassed . Heavy and/or prolonged domestic livestock grazing and fire exclusion have contributed to a historical decline in perennial grasses and an increase in shrubs—likely including granite prickly phlox—and trees at many sites (, Tausch and others 1991, Laycock 1991, cited in ). In 2001, Ott  reported a reversal in this trend, with shrubs and trees being lost as a result of an increased number of large, severe fires (Tausch 1999 cited in ). One of the factors contributing to this increase in fire is the presence of invasive nonnative annuals, particularly cheatgrass . See Fire Effects and Management for information on the effects of grazing and nonnative invasives on fuels and fire regimes in communities with granite prickly phlox. Granite prickly phlox populations typically increase since time of disturbance. The presence of granite prickly phlox in seral plant communities depends on the type of disturbance (e.g., grazing or fire) and its severity, frequency, and seasonality. In a 45-year study of vegetation changes on a big sagebrush steppe with a variable history of grazing, total shrub cover increased from 17% to 25%. Granite prickly phlox cover was small initially, but increased "substantially" over the time period. Its cover did not track precipitation closely . Grazing: Many habitats in which granite prickly phlox occurs are grazed by domestic livestock (e.g., [18,26,83]). Clary (1975 cited in ) reported that in the settlement period, nearly 80% of pinyon-juniper woodlands was grazed. Domestic livestock grazing is associated with a reduction of palatable grasses, forbs, and shrubs; an increase in "less palatable" species such as granite prickly phlox; and an increase in nonnative invasive species such as cheatgrass and medusahead (Taeniatherum caput-medusae) [13,15]. Other reports indicate that granite prickly phlox may increase [11,55,148] or decrease [19,54] with grazing. One study noted that granite prickly phlox cover was similar in ungrazed sites (1.24%) and sites grazed by domestic livestock and wild ungulates (range: 1.02-1.62%) . Granite prickly phlox's response to grazing was not well known as of this writing (2010). Results of studies are difficult to compare because grazing levels are not described quantitatively. Apparently, grazing management practices can have a positive, neutral, or negative impact on granite prickly phlox. Research from Nevada and Idaho found that granite prickly phlox increased with grazing, particularly with heavy grazing. In intensively domestic sheep-grazed and burned (25 years prior) big sagebrush/cheatgrass rangelands at Medell Flat near Reno, Nevada, granite prickly phlox density was recorded for a grazed plot (2 years of 3-pasture rest-rotation grazing) and a plot excluded from grazing for 19 years. Granite prickly phlox was not present on the ungrazed plots, but density was 6 plants/10 m² on grazed plots . In northern Nevada, granite prickly phlox was not recorded in black sagebrush/bluebunch wheatgrass, black sagebrush/needle-and-thread grass, and low sagebrush/antelope bitterbrush/bluebunch wheatgrass communities that were relatively "pristine" (showed no signs of grazing, erosion, and wildfire; had no tree overstory; and had uniform shrub and grass cover). However, granite prickly phlox occurred in black sagebrush/Indian ricegrass (Achnatherum speciosum) communities that had been "severely" grazed by livestock . Granite prickly phlox also occurred in big sagebrush/rubber rabbitbrush/Sandberg bluegrass in central Nevada, a community that "resulted" in part from "overgrazing" . Mean granite prickly phlox cover in threetip sagebrush/bluebunch wheatgrass/arrowleaf balsamroot (Balsamorhiza sagittata) shrubland near Dubois, Idaho, was higher in domestic sheep-grazed sites (range: 1.1-1.3%) than in sites where domestic sheep were excluded (0.7%) . At the National Reactor Testing Station in Idaho, vegetation change was assessed in big sagebrush/bottlebrush squirreltail shrublands over a 15-year period since exclusion of livestock. Granite prickly phlox cover declined with livestock exclusion, although it was sparse throughout the study (≤0.2% cover, ≤4% frequency, and ≤0.25 plants/m²) . Because granite prickly phlox may increase with heavy grazing, it has been described as an indicator of rangelands in poor condition . Other studies, some from similar areas, indicate that granite prickly phlox abundance may decrease with various grazing levels. In Colorado pinyon-Utah juniper woodlands of northeastern Arizona, mean granite prickly phlox cover was less (0.9%) in areas that were moderately to heavily grazed year-round with domestic sheep and cattle than in areas protected from grazing for 40 years (2.0%) . Volland  found that in big sagebrush/western needlegrass shrubland of Oregon, granite prickly phlox was usually absent in "overgrazed" areas but present in "good" livestock forage areas. Studies in threetip sagebrush/granite prickly phlox at the US Sheep Experiment Station found that granite prickly phlox cover declined with domestic sheep grazing [54,79]. Relative cover of granite prickly phlox remained at or near 100% for 2 years following initiation of grazing but then declined to approximately 70% and remained close to that level until the end of the 9-year study. This suggests that domestic sheep grazing suppressed granite prickly phlox production . West and others  found that mean granite prickly phlox density and recruitment were less on fall domestic sheep-grazed plots (density: 2.8 plants/m²; recruitment: 1.4 seedlings/m²) than on ungrazed plots (density: 5.0 plants/m²; recruitment: 2.0 seedlings/m²). For more information on this study, see Stand and age class structure. The season and frequency of grazing may influence granite prickly phlox abundance, but their effects on granite prickly phlox were not well known as of this writing (2010). A study in threetip sagebrush/bluebunch wheatgrass/arrowleaf balsamroot shrubland near Dubois, Idaho, reported that mean granite prickly phlox cover was similar in spring domestic sheep-grazed (1.3%) and fall domestic sheep-grazed (1.1%) sites . At the US Sheep Experiment Station, granite prickly phlox cover was greater on a site grazed multiple seasons than a site grazed one season. Mueggler  compared a spring-and-fall grazed site with a site grazed only in fall. Over 25 years, production of granite prickly phlox was more than double in the spring-and-fall grazed site (x=11.98 herbage dry weight) compared to the fall-grazed site (x=3.48 herbage dry weight). Domestic sheep stocking rates differed within and among sites over the 25-year study period . For more information on this topic, see Importance to Wildlife and Livestock. Immediate fire effect on plant: Fire usually kills granite prickly phlox . Fire adaptations: Granite prickly phlox establishes from seed after fire . Seed sources (on- or off-site) are unknown. Due to limited studies, it is uncertain how quickly granite prickly phlox establishes after fire. Studies are needed on granite prickly phlox fire ecology. Mean biomass (kg/ha) of granite prickly phlox before and after a July lightning-caused wildfire in sagebrush-bunchgrass of central Utah. Different plots were sampled each year of the study . The authors could not discount the possibility that because different plots were sampled each year of the study, the increase in granite prickly phlox was an artifact of sampling methods. Precipitation was above average postfire years 1 and 2 . Granite prickly phlox also increased slowly after fire in other desert ecosystems. At 3 sites near Reno, Nevada, granite prickly phlox was more common on old than new burns. Mean granite prickly phlox frequency was 7% at a site burned in a wildfire 23 years prior to the study, 3% at a site burned by an "intense" wildfire 5 years prior to the study, and 3% at a site burned in a wildfire 3 years prior to the study . In big sagebrush communities of Medell Flat near Reno, granite prickly phlox density increased on alluvial terraces from the time of a July wildfire to measurements taken 10 years later after heavy grazing. Granite prickly phlox density increased by seedling establishment in areas where shrub canopy was eliminated, but only in areas where cheatgrass did not increase and perennial grasses were not abundant . This study suggests that granite prickly phlox may benefit from openings created by fire. In postfire year 1, precipitation was below average in spring and near average for the rest of the year. In postfire year 2, precipitation was 2 times above average. In general, the vegetation changed from shrub-dominated patches to perennial grasses or annual forbs after the fire . In an area with sparse granite prickly phlox, other researchers found that granite prickly phlox decreased or showed no change in burned areas relative to unburned areas. Mean granite prickly phlox cover in a 15-year-old, July-burned sagebrush site on the Idaho National Engineering Laboratory was less (1.3%) than mean granite prickly phlox cover in an adjacent unburned sagebrush site (4.1%) . In sagebrush and pinyon-juniper woodlands in west-central Utah, granite prickly phlox occurred at 2 sites burned in separate lightning-caused wildfires and adjacent unburned sites. Both burned sites were chained and/or seeded the fall after the fire. Granite prickly phlox occurred at similarly low frequencies (0-6%) in both burned and unburned sites from postfire years 1 to 3 . In general, "most" species of native grasses, shrubs, and trees changed little in frequency, density, and cover from postfire years 1 to 3. Postfire year 1 was a year of above-average precipitation; the spring of postfire year 2 had above-average precipitation but was followed by a late-summer period of below-average precipitation . In a related study, Ott  looked at the same and additional burned sites and examined the frequency of plants in chained and seeded and unchained and seeded burned sites. Granite prickly phlox was not seeded and was a minor component of the vegetation (0-4% frequency) throughout the study. No trend in granite prickly phlox abundance was observed from postfire years 1 to 3, but it occurred in both chained and unchained areas . In general, seeded grasses became dominant in chained sites, whereas unchained sites were dominated by cheatgrass during postfire years 1 and 2 . Other researchers reported that low granite prickly phlox abundance in burned and unburned sites made it difficult to evaluate trends . Fuels: Stand structure in habitats with granite prickly phlox is typically open with scattered shrubs and herbs and extensive rock and bare ground cover, but vegetation may vary from very open to moderately dense (e.g., [1,22,70,113,115,123,124,126]). Potential fire spread depends greatly on stand structure, which is influenced by site conditions. Granite prickly phlox is common in black sagebrush communities (see Habitat Types and Plant Communities). These communities may function as fuel breaks in areas where productivity—and consequently fuel loads— is low, while more productive sites are susceptible to rapid fire spread (see the FEIS review of black sagebrush). On Lassen National Forest in northeastern California, granite prickly phlox occurred in a ponderosa pine-Jeffrey pine/curlleaf mountain-mahogany (Cercocarpus ledifolius)/bluebunch wheatgrass forest where fires were "somewhat limited" because of the "inherent fireproofing afforded by the extreme rockiness, which acts as an effective firebreak" . Total plant cover in habitats where granite prickly phlox occurs is typically <25%, and rock and/or bare ground cover is typically >30%. Granite prickly phlox cover in Great Basin bristlecone pine forest in the White Mountains was 1% where total shrub cover averaged <7% . It was "common" at Craters of the Moon National Monument where total shrub cover was typically <5% . In the Upper Rio Puerco watershed, granite prickly phlox occurred in big sagebrush communities where total plant cover was 12% and bare soil cover was 82% . It occurred in big sagebrush/bluebunch wheatgrass and low sagebrush/Idaho fescue communities in southeastern Oregon where shrub cover was 14% to 15% and perennial cover was 10% to 11% . It occurred in mat muhly-pine needlegrass grasslands where plant cover totaled 21%, rock cover was 55%, and gravel and sand cover totaled 24%. It also occurred in whitestem goldenbush-compact phacelia (Ericameria discoidea var. discoidea-Phacelia hastata var. compacta) communities where plant cover totaled 15%, rock cover was 50%, and gravel and sand cover totaled 34% . At the US Sheep Experiment Station, granite prickly phlox occurred in threetip sagebrush-bluebunch wheatgrass where rock covered 20% to 30% of the area , and on the Fremont National Forest, granite prickly phlox occurred where rock covered 30% to 80% of the area . Granite prickly phlox occurred in black sagebrush in Wyoming where bare ground cover was >50% . In the Cheyenne River Basin, granite prickly phlox occurred in needle-and-thread grass/blue grama sodgrass steppe where grass covered >60% of the ground surface, and bare ground and stones covered >35% . In most plant communities, granite prickly phlox cover is low (<5%), although it may exhibit high frequency and/or constancy . In stemless mock goldenweed-granite prickly phlox in alpine steppe of the Sierra Nevada, granite prickly phlox cover was 2.2% . In the Cheyenne River Basin, granite prickly phlox occurred in several shrub and grassland communities with cover ranging from 0.1% to 1.5% . In the White Mountains, granite prickly phlox occurred in alpine areas with a mean cover of 0.1% . Its cover was always <0.1% in low sagebrush and black sagebrush communities in northern Nevada, but frequency ranged from 1% to 11% . Granite prickly phlox frequency ranged from 0.8% to 3.8% and constancy ranged from 33% to 100% in big sagebrush, Utah juniper, and singleleaf pinyon communities in Coils Creek Watershed in central Nevada. It occurred with least frequency and constancy in big sagebrush/rubber rabbitbrush/Sandberg bluegrass, a community that "resulted from" overgrazing, gully erosion, and draining of a meadow . In big sagebrush/needle-and-thread grass in Nevada, mean frequency of granite prickly phlox ranged from 0 to 16.5% . In big sagebrush-winterfat/thickspike wheatgrass shrubland at the Idaho National Engineering Laboratory, mean cover of granite prickly phlox was 0.5%, but mean frequency ranged from 17% to 37% . It occurred in big sagebrush and pinyon-juniper woodlands in the Duckwater Watershed in central Nevada, where granite prickly phlox cover was always <1%, frequency was always <4%, and constancy ranged from 20% to 75% . Granite prickly phlox was a characteristic species (0-10% cover, 30% frequency) in low sagebrush/red fescue (Festuca rubra) communities on the Fremont National Forest in Oregon . Its cover was always higher in low sagebrush (5.6-6.3% cover) than big sagebrush (1.6-3.8% cover) communities in Blaine County, Idaho . Mean granite prickly phlox cover was 2% in a limber pine/antelope bitterbrush woodland at Craters of the Moon National Monument . In limber pine forest on the Medicine Bow National Forest in southeastern Wyoming, granite prickly phlox cover was ≤1%, and it occurred in 2 of 8 stands with a frequency of 8% and 36% . Effect of nonnatives on fuels: Nonnative grasses such as cheatgrass and medusahead have invaded many communities in which granite prickly phlox occurs. When precipitation is adequate in sagebrush communities, the spaces between sagebrush plants may be completely covered by these grasses. The highly flammable, fine fuels of nonnative grasses, and dense accumulation of long-lasting litter, create conditions that easily carry fire . Invasion can initiate a grass/fire cycle where nonnative grasses colonize an area and provide the fine fuel necessary for the initiation and propagation of fire. Fires then increase in frequency, area, and possibly severity. Following these grass-fueled fires, nonnative grasses recover more rapidly than native species and further increase fire frequency . Frequent fires may remove the shrub component of the plant community, and potentially part of the bunchgrass community, without killing "significant" amounts of invasive grass seed . It is unclear how alterations in fuels due to nonnative invasives have affected granite prickly phlox ecology. Because fire usually kills granite prickly phlox, increases in fire severity and frequency as a result of increased fuels would likely decrease granite prickly phlox in sagebrush and pinyon-juniper woodland communities in the short term, and possibly eliminate granite prickly phlox if fires are too frequent to allow seedling establishment . For more information on how nonnative invasives alter fuel loads, see FEIS reviews of cheatgrass, medusahead, and other species of interest. Fire regimes: Granite prickly phlox occurs in plant communities with a wide range of fire regimes. It occurs in shrublands with light fuels and historically infrequent and patchy fires, such as low sagebrush and true mountain-mahogany (Cercocarpus montanus) communities that grow on poor soils and produce little fuel. It also occurs in shrublands with relatively dense herbaceous understories and historically frequent fires, such as many antelope bitterbrush and sagebrush communities where fire-return intervals averaged 15 to 25 years (review by ). Granite prickly phlox occurs in pinyon-juniper woodlands where low-severity surface fires were historically uncommon, and fires were rare but variable in frequency and severity. Fire-return intervals in pinyon-juniper were likely >50 years, because shorter intervals would have eliminated the conifers (review by ). Granite prickly phlox occurred in old-growth western juniper woodland in central Oregon where fire-return intervals were >200 years . Grasslands with granite prickly phlox probably had frequent (<35 years) fires that consumed most aboveground plant parts. Grasslands on very poor soils produce little biomass and probably had less continuous and less frequent fires than other grassland types (review by ). Thus, generalizations regarding fire regimes in habitats where granite prickly phlox occurs are difficult. The Fire Regime Table summarizes characteristics of fire regimes for plant communities in which granite prickly phlox occurs. Find further fire regime information for the plant communities in which this species may occur by entering the species name in the FEIS home page under "Find Fire Regimes". For more information, see FEIS reviews of species of interest. Effects of nonnative invasives on fire regimes: Many habitats in which granite prickly phlox occurs are invaded by nonnative annual grasses such as cheatgrass and medusahead [6,128,146,147]. The expansion of nonnative annual grasses has established a grass/fire cycle, substantially increasing fuels and fire frequency in many plant communities throughout the western United States . For example, the Snake River Plains, where granite prickly phlox occurs, was historically vegetated with shrubs and bunchgrasses. The primary disturbance was patchy, stand-replacement fire, occurring every few decades. Because bunchgrasses did not often provide adequate continuous fuels, fire usually occurred where sagebrush or other shrubs had grown dense. With invasion of nonnative annuals, historical patterns of postfire succession have been altered. Fire-free intervals have been reduced, and shrub-bunchgrass communities are being converted to annual grasslands. According to Peters and Bunting , "the landscape has become more homogenous, species diversity has decreased, and burns are larger and more continuous". Thus, nonnative annual grasses may have a severe effect on granite prickly phlox. The impact of fire regime changes may differ by region and plant community due to differences in plant composition and structure [31,101,141,143] and to climatic differences such as occurrence of summer thunderstorms [12,69]. Effects of grazing on fire regimes: Grazing can increase nonnative invasive species in many communities in which granite prickly phlox occurs, and consequently alter fire regimes. Heavy livestock grazing since European settlement in sagebrush and pinyon-juniper woodlands resulted in higher than average juniper and pinyon densities, increased sagebrush dominance over large areas, and loss of native grasses and forbs in the understory, which apparently decreased the incidence of wildfires in these woodlands [33,139]. It is unclear how alterations in fire regimes due to grazing have affected granite prickly phlox ecology. Granite prickly phlox often increases with grazing, suggesting that grazing may have increased granite prickly phlox. Granite prickly phlox requires full sun for seedling establishment, so long fire-return intervals due to grazing would probably benefit granite prickly phlox until the canopy closes. To date (2010), there were few published recommendations for managing granite prickly phlox with fire. Because fire usually kills granite prickly phlox , frequent prescribed fires would probably result in granite prickly phlox decline. Use of prescribed fire may be limited in communities where fuels are insufficient, such as sites with droughty soils or heavily grazed areas . Fuels are sparse in many communities in which granite prickly phlox occurs, and when these communities are in pristine condition, fires are typically not needed to maintain the sparsely-vegetated structure (see Fuels). However, occasional prescribed fire may be a valuable management tool to maintain openings on productive shrubland and grassland sites where conifers are invading . Granite prickly phlox often occurs in canopy openings , so small, patchy fires may benefit granite prickly phlox by providing openings that allow it to establish from seed. Pechanec and others  suggested that prescribed burning in late summer or early fall (mid-August-September), when granite prickly phlox seeds are disseminated, may reduce fire's impacts on native plant recruitment and reduce soil loss from wind and erosion in sagebrush/bunchgrass communities. After fire, the authors advised protecting the areas from grazing for 1 full year. Light grazing could be initiated the 2nd year after fire to favor recruitment of perennial grasses. Moderate rotation grazing was considered permissible after the 3rd year . Because cheatgrass cover may increase, the authors recommended that prescribed fire not be used in sagebrush/cheatgrass communities. Granite prickly phlox foliage has high levels of plant secondary compounds. Photo courtesy of Larry Blakely, CalPhotos. Granite prickly phlox provides forage for wildlife. Its leaves and stems are consumed by mammals, including yellow-bellied marmot , black-tailed jackrabbit , American pika , mule deer [7,78], bighorn sheep , and pronghorn [8,38]. As of this writing (2010), consumption of granite prickly phlox seeds by wildlife had not been reported, but the seeds are likely consumed by a variety of birds (e.g., chukar) and small mammals (e.g., kangaroo rats and pocket mice) . Livestock such as horses, cattle, and domestic sheep consume granite prickly phlox, but granite prickly phlox foliage is typically considered of "low forage value" [35,39] except perhaps in spring (see Palatability) [35,78]. For more information on consumption of granite prickly phlox by livestock, see Grazing. Palatability: Granite prickly phlox palatability is generally low, in part because of high levels of toxic secondary compounds . Granite prickly phlox typically does not constitute a substantial portion of the diet of wildlife species [7,78]. It is "poor" to "fair" forage for small mammals, small nongame birds, upland game birds, and waterfowl . Dearing  reported that American pika stored granite prickly phlox in caches for consumption in winter and speculated that storage degraded the toxins over time and permitted eventual consumption of the plant. Wildlife consumption of granite prickly phlox foliage often increases in late fall and winter, when more palatable species are less available (e.g., [29,37]). However, in the Red Desert of Wyoming, pronghorn consumed more granite prickly phlox in spring (8.1%) and summer (3.1%) than winter (0.1%) . Granite prickly phlox palatability may increase in spring when leaves are more succulent . Cover value: Granite prickly phlox is short statured (see Botanical Description) but may provide cover for small mammals  and birds such as sage-grouse . According to Dittberner and Olson , granite prickly phlox has low to moderate establishment requirements; low potential for biomass production; and low potential for erosion control. Native Americans used granite prickly phlox for medicinal purposes . Granite prickly phlox cover is low in most habitats (see Fuels). Consequently, management recommendations for granite prickly phlox were rare as of this writing (2010). However, active management of plant communities in which granite prickly phlox is a part, particularly sagebrush and pinyon-juniper woodland communities, is frequently recommended (e.g., [13,14,71]). The goals of managing sagebrush communities are often to restore form, function, and ecological processes that have been altered by grazing and fire exclusion (review by ). Rangeland restoration goals in sagebrush communities sometimes include decreasing trees and shrubs and increasing native grasses. Techniques include reseeding with desirable species; deferring grazing until after "range readiness"; manipulation of stocking rates; deferred-rotation grazing systems; and selective control of target species by herbicides, prescribed fire, and mechanical methods [13,14,71]. Ultimately, effectiveness of rangeland restoration treatment depends upon site condition, which influences the rate and amount of recovery and resources required to reach management goals. See specific FEIS reviews for management considerations for plants dominant in communities in which granite prickly phlox occurs. Granite prickly phlox was not seeded and was "apparently not able to compete successfully with associated species" . Precipitation during the 3 years following treatment was above normal. Conversely, Clary  reported that granite prickly phlox increased after a similar rangeland treatment in pinyon-juniper at the Oak Creek Mountain Range Evaluation Area near Fillmore, Utah. Five years after treatment, granite prickly phlox production was 3.3 lb/acre on chained and seeded sites and 1.2 lb/acre on untreated control sites. Granite prickly phlox was not seeded, and precipitation during the 5 years following treatment was above normal . For more information on granite prickly phlox's response to mechanical site treatment in combination with fire, see Plant response to fire. See Grazing for information on granite prickly phlox's response to grazing. The following table provides fire regime information that may be relevant to granite prickly phlox habitats. Find further fire regime information for the plant communities in which this species may occur by entering the species name in the FEIS home page under "Find Fire Regimes". Fire regime information on vegetation communities in which granite prickly phlox may occur. This information is taken from the LANDFIRE Rapid Assessment Vegetation Models , which were developed by local experts using available literature, local data, and/or expert opinion. This table summarizes fire regime characteristics for each plant community listed. The PDF file linked from each plant community name describes the model and synthesizes the knowledge available on vegetation composition, structure, and dynamics in that community. Cells are blank where information is not available in the Rapid Assessment Vegetation Model. Surface or low: Any fire that causes less than 25% upper layer replacement and/or removal in a vegetation-fuel class but burns 5% or more of the area [52,74].